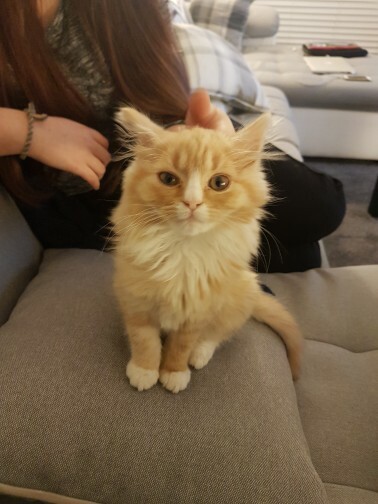 A friend recently adopted a kitten – I may have mentioned this before – and the ex-Lady M and the Charleesi have been dropping round to cat sit when his job takes him elsewhere for periods of time. There is no small amount of danger that they will try to unofficially adopt the kitten at some point. They’re already providing additional toys on their visits. Admittedly, it is a very cute kitten. I have always had a somewhat mixed relationship with kittens and felines of other stripes, but even I have to admit to general fuzzies with the creature. So today, following another strenuous Body Balance session, we went round to catch up with them and the kitten, and to deliver a kitten carrier donated by Mre B that their cat had outgrown. I’m not saying that I’m growing to enjoy cats, but I did give consideration to Lady M’s half-teasing requests to adopt one of our own. I’m still very much in the camp that cats are best experienced in the style of neice, nephews, or other small children belonging to friends and relatives : fun to play with, but even better to hand back to their owners afterwards, especially if you’ve loaded them up with sugar or catnip and/or tired them out. Besides, I’m not a fan of waking up with a predator inspecting me in the small hours of the morning. This entry was posted in household, idle musings and tagged Cats, household, idle musings. Bookmark the permalink.